It’s Christmas, and what better place to celebrate the holiday than in Cedar Cove, Washington? During the past several years, Ms. Macomber has made the reader privy to the lives of her different characters in this quaint west coast town where the families and residents are close knit and kindhearted. Newcomer Beth Morehouse operates a Christmas tree farm, which she purchased after divorcing from her husband Kent, three years ago. She not only supplies the area with magnificent trees, but she is also a huge advocate of animals, taking in abandoned, abused, and wounded canines. Not long before the holiday season, ten puppies are dumped at her doorstep, and now she is responsible for making sure she can find all of them a good home. Bailey and Sophie, Beth’s college-aged daughters are due celebrate Christmas with her in Cedar Cove. Unbeknown to her and her ex, the girls are conspiring to bring their parents back together. Still in love with Kent, Beth wonders if he could perhaps feel the same about her, and she looks forward to his visit with both excitement and trepidation. Kent shows up bringing his much younger “friend” Danielle, which surprises his daughters and has Beth seeing her hopes for a reconciliation plummet. While Beth scurries around preparing for the holiday, her main worry is the fate of those puppies. An after-Christmas trip is planned for Beth and her daughters, so she needs to find them homes—and soon. And what to do about Kent and his little lady friend? Bailey and Sophie, surprised their dad would be with this flighty and emotional woman, decide to stop at nothing to get their parents back in each other’s arms. 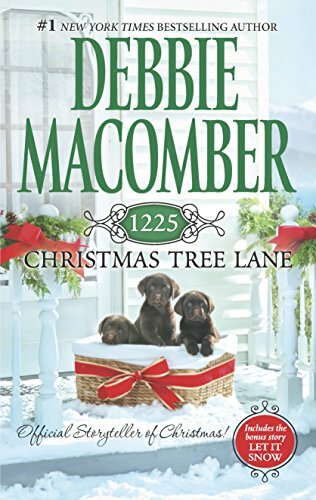 1225 Christmas Tree Lane wraps up Ms. Macomber’s series with this 12th book, allowing all the central characters in Cedar Cove to reveal what is happening in their lives. Almost all of the characters from the previous titles in the series are showcased in some way or another. 1225 Christmas Tree Lane reveals Ms. Macomber’s penchant for small town charm and happy-ever-after endings.